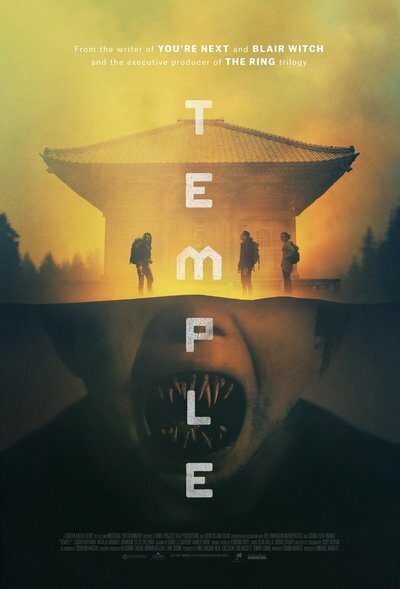 There is nothing memorable about “Temple,” a listless genre exercise about a trio of American tourists who travel to a haunted Japanese Shinto shrine. This is the horror movie equivalent of canned Spam: you could have it so much better if you tried harder (or at all). But if you choose to ignore my review, and watch "Temple" anyway, you will be plagued by moronic questions like, "So when do they arrive at the temple," "What is the deal with the temple," and "Who are these boring characters, and why are they dead-set on meeting their doom at the temple?" You will watch with mouth agape as three simpletons with no common sense traipse into an exotic forest—only it's mostly just dark, and misty, and there's a creepy kid and a statue, too. And you will wonder what the makers of "Temple" found so interesting about this particular narrative, setting, and group of characters, and why they didn't put any of that good stuff on camera? "Temple" begins and ends with an interrogation scene that doesn't pay off in any important way. Still, for a while, it seems ostensibly important to note that much of the film's plot is related by a severely deformed American, though it's unclear who the narrator is for much of the film. Our heavily-bandaged survivor leisurely relates his (or maybe her?) tale to an officious Japanese man in uniform named Ryo (Naoto Takenaka) and his translator Ittoku (Asahi Uchida). The story takes a while to unfold, but it's actually pretty simple: Kate (Natalia Warner) wants to visit Japanese temples and shrines, so she drags her Japanese-speaking childhood friend Chris (Logan Huffman), and her thin-skinned boyfriend James (Brandon Sklenar) to Japan. There are multiple boring danger signs along the way that should dissuade Kate's group from traveling to a secluded mountain shrine in the Tochigi prefecture. First, an easily spooked thrift store clerk tries to stop Chris from buying a tattered journal. The clerk seems distressed, but is not alarmed enough to explain herself. Then, Chris bumps into a creepy nine-year-old when he inexplicably returns to the thrift store he was just abruptly kicked out of. Apparently, Chris has never seen "The Grudge," "The Ring," or any horror movies for that matter. Next, Chris is warned about the temple by an amicable drunk. The pleasant-enough alky is more amused by Chris's interest than he is concerned. So, Chris says nothing about his suspicions—if he has any—to his friends, presumably because he wants to please/impress Kate. Then Chris and the gang go to a village near the temple, and stay overnight in a dark, secluded hotel. But they only arrive after an old man tries to warn Chris that a priest at the temple had a problem with his eyes after he saw some messed-up stuff at the temple. Chris doesn't understand what the crazy area man means by cupping two small oranges as he plaintively refers to eyeballs. Chris is a bit slow on the uptake, but this local guy is also admittedly not very convincing. At this point, "Temple" is only dull and misconceived. The characters' basic three-way relationship—Kate's got a secret, James is jealous, and Chris is maybe (?) into Kate—is not exactly foregrounded. In fact, so much time is spent setting up this laborious trip to the temple that when the first ghost finally shows up, you realize that you know nothing about these characters, or why director Michael Barrett and screenwriter Simon Barrett find them interesting. For starters, Michael—who makes his directorial debut here after working on a couple dozen films as a cinematographer—never seems to know how to film his actors in relation to each other. There's one scene where Chris, positioned in the right extreme foreground of a shot, asks a petrified geriatric, lurking in the upper-right corner of the camera's frame, for help. The older gentleman, quickly, and in one unbroken take, backs up and out of view. The effect is unintentionally comical: all it took for this guy to moon-walk out of the film was for Chris to say hi. Still, as "Temple" continues to unspool, it becomes apparent that the Barretts don’t know where they're going. They take their sweet time getting to anywhere within the vicinity of "meaningful." But they never really arrive because their pacing is too halting, their visually flat scare scenes aren't effective, and their ideas are ... well, not all there. Worst of all: the Barretts abandon both plot and thematic threads after an abrupt finale. I left with burning questions like, "Were my expectations too high," "Do the makers of this movie hate me," and "Does the editor who assigned me to review this film hate me?" But you can avoid a similar existential crisis. Just don't watch "Temple." There is no monster at the end of this story, only boundless regret, and tedium.